Bite-Sized (15 minutes): Melissa is back in the studio to help me answer a very common question from one of our viewers. Bill recently lost a friend and wants to know whether mediums are really in touch with our loved ones or are they just reading our minds. Melissa and I answer that question by discussing our own experiences with mediums along with some clues to help you decide if what’s being said is coming from your loved one. We also share some tips about how to get the most out of your reading. Join the AFTERLIFE TV NEWSLETTER and get notified of new episodes! In my research of mediums, and the hundreds of readings I’ve had for that research, I’ve noticed that some mediums don’t know when they suddenly begin using their psychic abilities while primarily giving a reading of mediumship. In this way, they are actually reading the energy around the person but presenting it (erroneously) as coming from a person in spirit (although they typically don’t know which spirit gave the message, or they will guess). I don’t really believe in mind reading, per se, at least not in the way most people think of it. Instead, I believe anything that seems like mind reading is actually the psychic reading the “energy field” around and within the person getting the reading. This is really a matter of semantics because the outcome is the same, but I think it helps to understand how psychics and mediums are getting this information and that the untrained or poorly trained are not aware of when they’re even switching from mediumistic to psychic ability. I, however, find it all fascinating. Thanks Ornella. So sorry for your loss Bill. I have used a medium from Bob’s list of Mediums. I see her twice a year and I cannot get enough of our sessions. So wonderful to have my husband bring in details of my daily routine that the medium could not have known, even at one point the medium laughed and said your husband is spying on you. Thank you Bob and Melissa, love all you do. So grateful Bob for provinding that list of Mediums from Hawaii. That’s wonderful news about the medium you found, and a funny message. My early messages used to describe the inside of my house and my routines, as well. That was always so cool because that really contains information the medium could not know or even guess. Of course Melissa’s first thoughts were (with concern in her voice), “Oh, does that mean that can see me in the shower?” I said, “I’m sure they have no interest in doing such a thing since they are no longer in the flesh,” but then I got thinking about it 🙂 – I later confirmed that with people in spirit via mediums later in my research. Thanks for sharing, Monique, and for your sweet words. Yes, I’ve had the psychic amnesia where I couldn’t make sense of a message that normally would have perfectly clear to me. Funny. Great examples, thank you! I have never been to a medium yet because so many unusual things have happened to me, such as visitation dreams etc. My question is -do you know anything about Theresa Caputo. the long island medium?I’m not sure what to think. PS— I just bought “The Magic Mala” and can’t wait to read it. 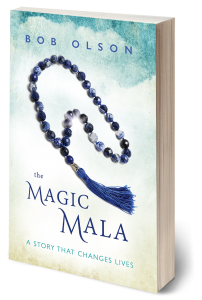 I’m excited that you got a copy of The Magic Mala: A Story That Changes Lives. Thanks! Don’t know Theresa Caputo personally, but she’s a lovely and entertaining character. I think she’d be fun to watch even if it were The Long Island Mattress Salesperson 😉 – If you’re wondering if I think she’s legit, I certainly do – no question in my mind. She’s doing good work in the world. Best wishes. The Magic Mala is an inspiration. I agree with your wife Melissa and you. The aura of the person gets the reading. My son went on holiday with his family some distance away. They were late home. I was worried that something had happened to them. My wife who passed away over four years ago came through to me and said they were ” Two Hours from Home” Imagine my surprise when he told me later that it would be two hours before they got home. It’s impossible to know this knowledge logically. Thank you. I appreciate you reading it. Great story. Such powerful validation. So sorry to learn about your wife’s passing. I am happy, though, to hear that you have such a strong connection with her still. Great question and great answer! I have never had been to a medium because I felt I made pretty good connections with relatives and close friends. Would most ‘mediums’ agree that ‘something someone else should not know’ will be provided or they would try again or refund some fees? I ask that as a ‘skeptic’ claimed ‘no validation’ was provided to him. I specifically asked him to discuss this potential with the medium before the reading but he did not. That’s a really good yet difficult question. Basically it’s not that much different than asking your auto mechanic if he’ll not charge for the two hours he worked on your alternator when it turned out to be a bad battery. Mediums obviously are not skeptical, so while they always hope spirit will deliver validating messages, they’re not always in control over who comes through or what messages are being conveyed. For these reasons, again reminding everyone that they know their abilities are legitimate, they consider their fee to be for their time, just like the mechanic. That said, a client will usually know if nothing being said is resonating as true pretty quickly. And if the client tells the medium that none of the information is accurate in the first few minutes, most mediums will stop the reading and either give a refund or reschedule for another day when the connection is likely to be better. As I said, it’s a difficult and intricate question, but that’s my short answer. I also have a much longer answer that’s not appropriate for a comment reply (I believe I talk about this in my book, Answers About The Afterlife). Thanks for asking it, Ray. Hi! I’m glad you always stress trying several psychics/mediums. I’ve had a total of around 15 sessions over several decades and about 4 of them blew my mind with accuracy–validations, messages, definite loved ones, etc. The rest were too vague or wrong and if I’d stopped going with any one of them I would have remained skeptical. One was so bad to the point of appearing fraudulent, but she has dozens of glowing reviews over many years, so I assume it was a poor connection between us. Thanks! I’m glad you stuck it out and persisted, too. That’s what I had to do. I’ve done episodes on this, as well as written articles on it. And I wrote about it in my book, Answers About The Afterlife. There are a whole lot of reasons for someone not being satisfied with a reading, but I’ve always thought of them as stepping stones to lead us along a new journey of understanding. I believe we learn as much from the not-so-good readings as we do the great ones. Thanks for your insightful comment. I am so very grateful for you! I lost my seven year old son, Ryan on July 17, 2014. My friend gave me your book shortly after, and it was the start of an amazing journey for me. I went to 2 mediums I got from your list, and I was blown away…you helped to save me. I am writing a book on all the premonitions and amazing signs from my son Ryan. I would love to come on your show someday and share. Thank you for your thoughtful comment. I appreciate you sharing how my work has benefited you. I’m so very sorry about Ryan’s passing. Without a doubt one of the most difficult and challenging tragedies a human being can endure. You, however, are on the best path one can hope for in this situation. I don’t believe children die without knowing it will happen prior to coming into this life, meaning I believe this is something both you and Ryan knew about while planning this lifetime together. Imagine how proud he is of you right now. Perhaps he’s conveyed that through mediums already. But also imagine how proud you will be of yourself when it is your time to rejoin with Ryan at our true home. You will look back and think, “Wow, I really did what I hoped I would do under those circumstances.” Good luck with your book. My best wishes to you. Thank you Bob. I want to make Ryan proud and I certainly don’t want all this pain to be in vain, so I focus on love and the magic of life. It is a roller coaster and it is not easy, but as Ryan told me one day when I was talking to him in my mind, “life would be boring if it was easy peasy lemon squeezy.” Thank you for all you do to raise awareness. We can all learn from that, Meg. Thanks for being an inspiration.